Hook, slice, and failure to find the sweet spot are familiar problems golfers face. The Adventure Kids take golf lessons at the Brendan McDaid Golf Academy at Rathsallagh Golf Club in Dunlavin, Ireland to help improve our golf game, proving that you can indeed learn a few new tricks. We love to play golf, however, with our hectic schedule, we do not get out to play as much as we would like, which often results in days of frustration at the golf course. When we decided to take a trip to Ireland, we thought that it would be the perfect opportunity to fit in a few golf lessons to take the rust off the old irons, so to speak. 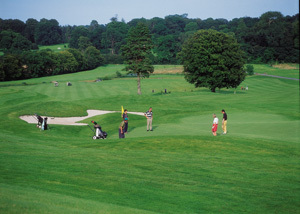 Ireland with its rolling, lush, green golf courses beckon to all levels of golfers from hackers to professionals, and the urge to play was high on our list of how we wanted to spend time on our trip in September 2007. After looking at various golf clubs, we decided on Rathsallagh Golf Club, a championship course (6,916 yards, par 72) designed by Irish Professional Christy O'Connor, Jnr. and former British Amateur Champion, Peter McEvoy, and listed as one of the top 30 (out of 415) golf courses in Ireland. Brendan McDaid, owner of the Brendan McDaid Golf Academy at Rathsallagh Golf Club is not only the European Tour Coach since 1999, he is also a regular contributor to Ireland Golf Digest magazine, so we felt that the man must have infinite patience with correcting bad habits, which would certainly come in handy when teaching The Adventure Kids how to improve our golf game. The morning was cool and overcast, and the greens were wet with dew as we began our golf lessons by working with Thomas O'Neill, Golf Professional on our short game. Tom, one of Brendan's P.G.A. Assistants, took us through a refresher course of pitching, chipping, hitting over the bunker, and lastly, working on our putting. One of the tips that we learned is that you need to visualize sinking the putt, as Tom told us to aim, swing, and close our eyes. We were actually amazed when we came close to the cup! 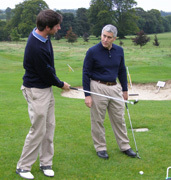 Another secret weapon that Tom pulled out of his arsenal of teaching aids is the use of a training mat, which reminded us where our swing should fall and trained us to keep our swings within the designated opening. After our short game lesson with Tom, it was now time to work with Brendan McDaid on our long game. Step 1 was to have Brendan analyze our swings using the state-of-the-art G.A.S.P. Video Analysis System. We took our position at the tee box, took a swing, and Brendan captured our swing on video so that he could show us areas we could improve our swing. Although it felt like we were swinging properly, looking at the monitor we could clearly see where our swings fell, or rather did not fall, within the preferred triangular range. Okay, now that we knew what we were doing incorrectly, it was time to right the proverbial wrong. Sometimes the easiest way to correct a bad swing is simply to readjust your grip, and in our cases, once Brendan had readjusted our grips, we were halfway home to improvement. Although we had learned the proper grip when we began playing golf years ago, somehow over time, we had managed to forget the correct hand placement and as a result our swings were off. 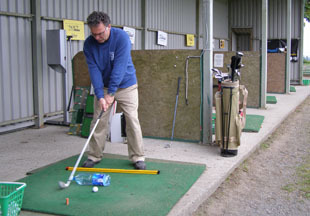 Feeling better already, we took our cues from Brendan as he worked on improving our long game at the driving range. Brendan has some unusual teaching methods and one of his methods involved a plastic bottle filled with water and a bar, which ensured that we were hitting within our range. If we missed, we would hit the bottle, and that simple visual clue was enough to keep us on target. Best of all, it was something that we could practice anywhere. 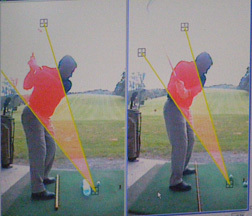 As we worked the driving range under Brendan's tutelage, our shots became more accurate, and more on target. Before we left the Academy, Brendan reminded us to practice the proper grip, our stances, and hit within our range. Confidence restored, and armed with our newfound golf skills, we look forward to playing our next round of golf. Of course, Rome was not built in a day, and we know that we will need to keep practicing in order to improve our game, but then hey, even the professionals miss a shot every now and then, so maybe there is hope for us yet. In any case, a day spent on the golf course is always a good day, especially now that our bad habits have been corrected. Read other articles on Rathsallagh House Golf and Country Club in the Hotels and Resorts, Restaurants, and Chefs' Recipes sections.